I was invited to participate in the “My Writing Process” Blog Tour by Aiswarya, a wonderful blogging friend of mine. The Tour has been making the rounds since at least a year and a half if I am not wrong, and it might be interesting to trace its origin. Each participant is asked to answer four questions and then pass the torch to three more bloggers. I am currently working on innovating new versions of the regular recipes. As I believe that Beautiful Aromas floating from a kitchen reflects a happy home and the way to a person’s heart is through his or her stomach, I constantly try to conjure up new recipes and present them in an appealing way. Each one of the recipes featured on my blog has been tried out in my Kitchen. I would never post anything which I have not cooked. Though in future, I plan to start a page on restaurant or street food review which of course I will mention. Cooking is my passion. I believe it is therapeutic. The satisfaction at the end of a well turned out dish is immense. I believe that a person first eats with the eyes. We reach out first to the food which looks more colourful and appealing to the eye. So, I like to play with the presentation of food and photograph it. Though I don’t have a professional camera or the skill of photography, I try my best to make my dishes look good on the post. I am learning by the day. I like to document these little adventures of mine in the kitchen. In other words, I want to encourage the readers to cook their way into the hearts of their loved ones. That is why I like to write my blog. The likes and comments which I receive along with each post make this process very enriching and endearing. It is simple. I record the adventure and the fun during the process of my cooking the dish and photographing it. I am hardly eight months old in the blogosphere and I was pleasantly surprised by the warmth of the Word press community. It didn’t take much time for my nervousness to wane off and get comfortable. I hope to churn out better posts in future and keep the readers entertained. I would love to take this opportunity to thank all my blogger friends old and new for extending a hand of support and encouragement and making every step of this journey memorable. I have in the process discovered some beautiful blogs. I want to pass the torch to three of them to continue with this Writing process tour . acasadisimi.com : This blog is authored by a young mother who opted to stay at home for the proper upbringing of her lovely children. She shares her passion for cooking in this blog and firmly believes that cooking for others is a way of expressing her love for them. Simi is a person after my own heart. She whips up some amazing dishes and presents them with beautifully captured pictures. This blog is a must visit. cookingwithmrfitz.com : This is one wonderful blog which shares A COLLECTION OF FOOD JOURNEYS & TASTE-FULL EXPERIENCES. The author takes us on a remarkable culinary journey , recounting the experiences in a humorous way, making the art of cooking a process of fun and entertainment. If you haven’t yet discovered this blog, you must rush. Adorable life@nimmiafzal.wordpress.com : An amazing blog run by Nimmi Afzal, this one is a visual and gastronomic delight for visitors. She shares beautiful recipes accompanied by awesome photography in a simple and lucid manner. Do visit this blog if you haven’t till now. Fun to read your answers! 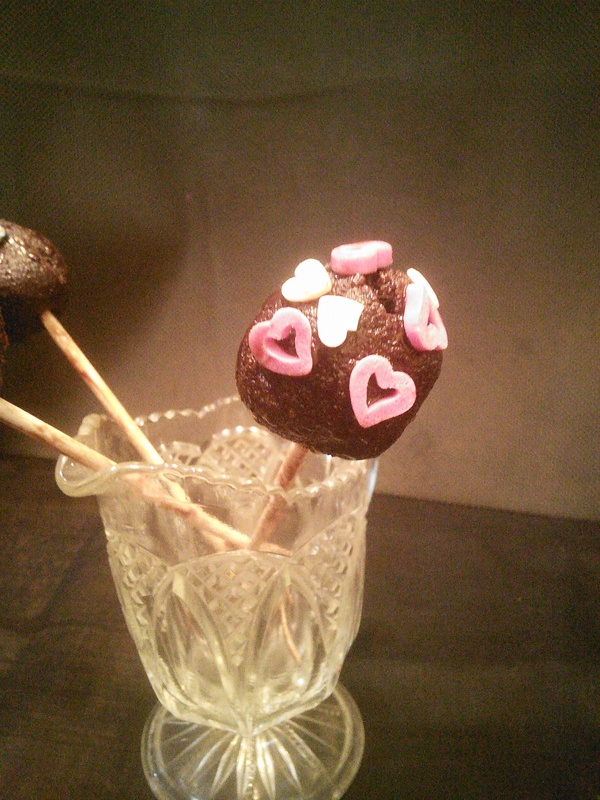 Lovely cake pops! For accepting the invite for the blog tour. Wonderful reading about your writing process and I love those cake pops!I think this writing blog tour is so much fun and such a great way to get to know each other.